Maureen Johnson's blog and tweets are always worthy of your time, but this account of her dinner with Justine Larbalestier and Scott Westerfeld is possibly, one of the funniest, laugh-out-loud things I have read in a long time. An Old-Fashioned Girl, by Louisa May Alcott and Understood Betsy, by Dorothy Canfield as a young'un. Whether e-booked, audio-ed or between the covers, we love the books. Wide awake now and reading 3rd book in Cinda Williams Chima's "Heir" series, The Dragon Heir. Have been stinging for months now over the ent nephew's astonishment that he had read a book before I had. Finished Dragon Heir. The ent-nephew told me something happened to one of the characters and it made him sad. He was right. It made me sad too. Given this busy weekend I am glad I was able to read one book, much less two. What a terrific book to end on for my 48 Hour Book Challenge. I will review the book in more depth later this week but I will say that I was completely engrossed in this story. This well written historical fiction considers what it must have been like to have been a living near the Chernobyl Nuclear Power Plant when the disaster occured. Will not disclose the title of the book I am reading as I worry the activities comsuming my afternoon will be a reflecton on the book. The book is very good, so far. Opened one eye. What is wrong with me? Post graduation letdown? Relief that I am finished (as a parent) with public education? Ooohhh, the TURKEY sandwhich I ate for lunch. 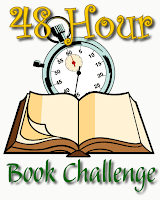 Visiting family, high school graduations, and children home for the festivities will not deter me from my participation in MotherReader's 48 Hour Book Challenge this year. Oh, I may ONLY manage one book but it is fun to think that this is a weekend of reading all over the Kidlitosphere and beyond. My theme this year will be: Books I should have read by now but never got around to. Clocking in at 7 a.m. Saturday, June 6, 2009. It is National Donut Day! The first indication that civilization has arrived in a new neighborhood or subdivision is the opening of a donut shop. This donut chef opens his new Donut Land shop and it is a great success. When another donut shop opens on the street, the competition becomes fierce as both stores offer discounts, extra frosting and exotic flavors to entice the public. In an emperor-has-no-clothes moment a little girl laments that she cannot get a plain glazed donut and the chef realizes that simple is best. This cautionary culinary tale emphasises the virtue and value of doing one thing very well. 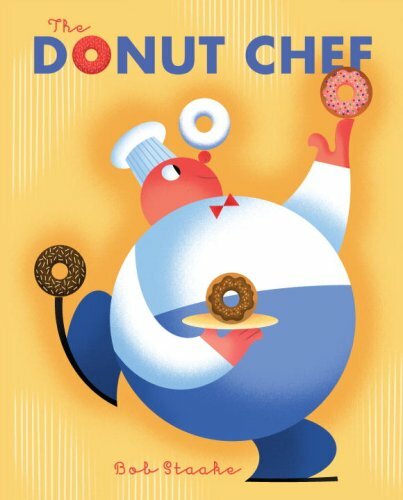 Staake's signature digital illustrations consist of the circles and geometric shapes that are perfect for a book about donuts. To continue the celebration of donuts go enjoy GottaBook's ode to donuts, Doughnuts! Oh, Doughnuts! Less fat and fewer calories! Ah yes--the end of the school year is such an interesting time in a school library. Librarians run and run and print and print reports that present the grim statistics about the horrific number of books STILL checked out to students even though the end of school is just a few days away. Librarians send out MORE reminders and requests for the return of missing books. Librarians cheerfully call home phone numbers and leave messages requesting any kind of response or acknowledgment of the lost school library books. Librarians cheerfully walk to the shelves with students to look for the book that the student is positive he/she already returned or never checked-out in the first place, "no doubt about it, honest, they remember." Librarians cheerfully point out that the book is NOT on the shelf, therefore, it will be necessary for the student to look again. Librarians cheerfully suggest places the child can look for their library book. The librarian's child, who is watching those morning announcements in horror, from her classroom, SWEARS her mother is NOT at school that day when her classmates suggest Viola bears a resemblance to her! Librarians cheerfully roll book carts down to 5th grade and request that everyone clean out their desks in the hope that lost library books will materialize. Librarians cheerfully roll book carts back to the library having netted at least twenty missing books that suddenly appeared in desks, on classroom counters and mixed in with classroom libraries. Librarians cheer and clap as the student, who was sure that he/she had already returned or had never checked out that book in the first place, "no doubt about it, honest, they remember," comes running in, beaming with joy announcing, "I found it, I found it!" Librarians cheerfully listen to teachers who explain they never checked out those materials for their classroom "no doubt about it, honest, they remember." Librarians gulp hard and hug children who present them with flowers, cookies, picture frames, and precious thank-you notes for a year that was full of reading and imagination. School librarians, you've worked so hard all year. Have a wonderful summer and try not to think about your library every day this summer.